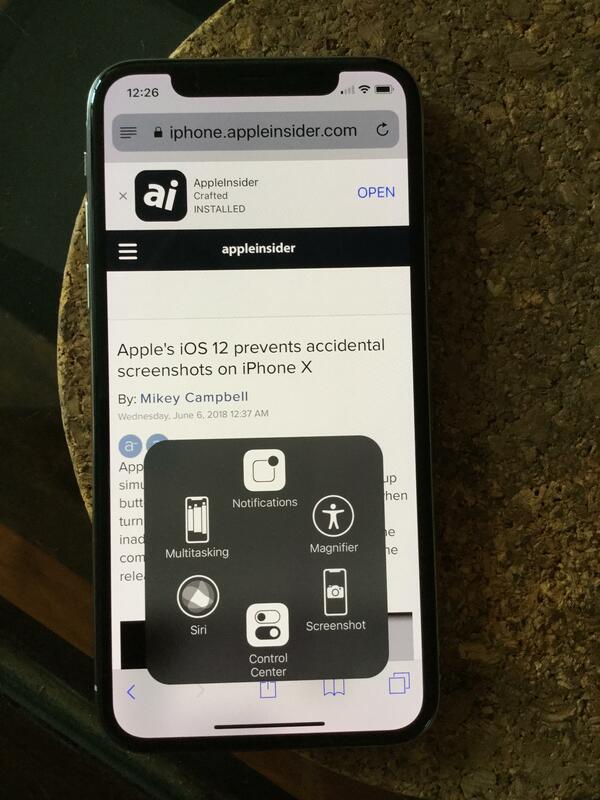 Apple's iPhone X screenshot mechanic -- a simultaneous press of the side and volume up buttons -- is for some too easily triggered when turning the device on, resulting in multiple inadvertent screenshots per day. It seems the company has addressed the problem with the release of iOS 12. Traditionally, capturing a screenshot on iPhone, or any iOS device for that matter, has been a deliberate process that typically necessitates the use of two hands. Models with Touch ID require users press both the home and sleep/wake buttons at the same time, a somewhat awkward gesture that in large part prevents accidental activation. With iPhone X, Apple abolished the home button, meaning screenshot management had to be mapped to the handset's remaining physical controls. Apple elected for the volume up button and -- enlarged -- side button, controls that sit directly opposite each other on the handset chassis. The arrangement is much easier to access than its Touch ID-sleep/wake counterpart, and therein lies the problem. Due to the handset's slim design, users often pick up the device by grasping it on two sides, a motion that for some inevitably triggers a screenshot. Luckily, Apple implemented a tweak in iOS 12 that should rectify the issue, at least in part. In the first beta version, released to developers on Monday, screenshots are deactivated until iPhone's screen is awake. That means no inadvertent snaps when a sleeping iPhone X is picked up off a flat surface. The screenshot feature does, however, become active once the display is on. Since iOS incorporates a wake-on-raise feature, the screenshot issue might persist for users who constantly fumble around for their iPhone X in a bag or jostle their device prior to grabbing it. Still, the OS-level change is a step in the right direction and shows Apple is cognizant of user reported troubles, even minor niggles that are at most mildly inconvenient. There has to be better button placement. I agree! Just don't have the volume buttons directly across from the power button. I don't know how this has gone on for so long. I just use a button on Assistive Touch to get a snapshot. Works brilliantly. No need to use physical buttons. Yes, because a sizeable proportion of iPhone user base is made up of French mimes and circus clowns. Just no! Goes away with your stupid idea. It's time Apple returned the power (sleep/wake/'side') button back to the top of the phone, where it always was prior to the iPhone 6. The new placement on the side is a really bad decision in my opinion. Aside from this new screenshot problem, I've always found the side button a nuisance. I'm always pressing it by accident when I'm trying to put the phone away in my pocket, and yet I can't get at it quickly when I want to press it if the phone's already in my shirt pocket (e.g. to silence it quickly). The old position was perfect; the new location's a disaster as far as I'm concerned. If Apple put the button back on the top, where it always used to be, all these problems would be instantly solved. What way do you hold your phone? I have never taken a screen shot by accident. I most often take accidental screen shots when I am using one hand to put the phone to sleep or using one hand to raisie the volume. The fix doesn’t seem to address that. Does that turn off the hard buttons? If not, the accidental screen shots would continue. Has to do with closing the screen and/or taking it out of the pocket. Not sure exactly, but it is not uncommon for me to find a few screenshots of the home screen in my photo album. "Don't hold it that way." Never happened to me either, but I use Raise To Wake. Once in a while I manually put it back to sleep, but I think my case gives me a grip that doesn't lead to this issue. What triggers me is having the power button opposite the volume buttons. I absolutely hate that about the iPhone. My camera roll is full of screenshots because I accidentally registered a click on the volume button while pressing the power button side. I can't count how many times I have turned the phone off while trying to increase the volume. Having the buttons directly opposite each other by definition causes the applied force to one button to transmit into the button on the other side unless you consciously relax the specific finger placed against the opposite button. It is the single biggest design flaw on the iPhone. Totally agree with moving the home button back to the top of the phone Having two buttons directly opposite of each other is just horrible design. Even after 3 ½ years I still routinely press both the volume up and power buttons when trying to turn off my 6s. This problem has been since iphone 6, due to the placement of sleep/wake button, it is almost always accidentally pressed when volume up/down is desired. I've rarely had this issue with my iPhone X but obviously this change will benefit many others. Thankfully Apple continues to pay attention to even the smallest details. This isn’t the issue it is accidental screenshots by pressing buttons. I can confirm iOS12 fixes it. Yet another reason ditching the home button was a mistake. Also, the placement of the sleep/wake/power and volume buttons being opposite each other was a mistake since day one, and it's a compensation for making the phones too large. The physical design of iPhone has been inferior ever since they enlarged them. My pinky became a shelf (this causes cramps and soreness after a while), single-handed use has turned to two-handed, typing has had to become two-thumbed (and the keyboard does not accommodate this well, especially if you're fast), and they had to add a stupid screen sliding behavior just to reach the top of the screen (how does this work without a home button, by the way?). Apple hasn't cared about proper ergonomics and functional design since 2013 when iOS 7 came along, and nothing is getting better. iOS is just getting more and more convoluted in terms of gestures. This article's subject... This tiny change is not a solution to the more common problem of the wrong side buttons being triggered.